Oh, glorious french fries. Their crunchy texture, taste, and versatility — you can cover them in cheese, dip them in ketchup or ranch, or even eat them plain. 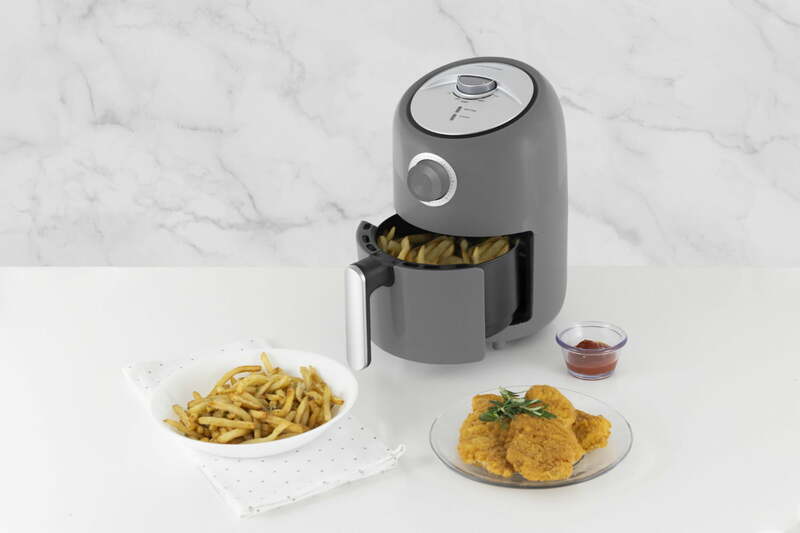 If you like eating crispy fried foods like french fries and chicken tenders, but you don’t want to add the extra fat and oil into your diet that you get with deep frying, there’s a solution: An air fryer. It uses a only small amount of oil, but you still get to experience those crispy, crunchy, and tasty junk foods. As more people try to eat better, kitchen gadgets like air fryers continue to increase in popularity. In addition to their ability to promote (slightly) better food choices, air fryers are also easier to use than some of the alternative cooking options. You just chuck in your ingredients with a small amount of oil and then set the timer. Sure, you may have to toss the basket around once or twice during cooking, but you don’t have to stand over a hot stove or worry about oil popping at you while you’re deep frying breaded zucchini or french fries. Like all kitchen gadgets, you should properly clean and maintain your air fryer though. If you don’t clean your air fryer, it won’t perform as optimally. Plus, it can accumulate smells and flavors, and those old flavors can transfer into other foods. Dirty air fryers can also build up grease, and that grease can cause your air fryer to smoke and reduce the quality of your food. Here’s how to clean your air fryer and keep it running at its best. Before attempting to clean your air fryer, unplug it from the wall socket and allow it to cool completely. This is to prevent electrocution, injury, or damage to your unit. Now, this may sound obvious, but sometimes when people are in a hurry, they really do forget to unplug their gadgets before cleaning. Clean the removable baskets and pans (frying basket, baking tray, etc.) with hot soapy water. If your basket has stuck or burnt-on food (like batter or potato), you can soak it in hot water and dish soap for about 10 minutes, and then wipe off the food particles. With some air fryers, the accessories are dishwasher safe. If your frying basket is dishwasher safe, then you can just pop it in the dishwasher. Refer to the manufacturer’s instructions to find out about dishwasher safety. Make sure your air frying basket, pan, and other removable accessories are all completely dry before you attempt to use them again. Using a soft cloth or non-abrasive sponge and hot water, clean the heating element. If there’s any grease present on the heating element, add a small amount of dish soap to the cloth or sponge to help remove the grease. Then, wipe away the soap with clean, hot water. You may want to turn the air fryer upside down to make cleaning the heating element easier. You can also use a soft-bristle food brush to remove any stuck-on dirt or particles. Wipe the interior completely with a non-abrasive sponge or cloth and hot water. You can use a very small amount of dish soap if needed to remove grease. Again, you can use a soft-bristle cleaning brush to remove stuck-on foods. Allow the interior of the air fryer to dry completely. Wipe the exterior with a moist cloth or sponge and a mild detergent. Avoid using glass cleaners, bleaches, or heavy cleaners. Also, never immerse the air fryer itself in water. Clean your air fryer after each use to prevent it from accumulating food particles and building up grease. After you clean your air fryer, allow it to dry completely, and then store it in its original box or in a clean and dry place (i.e. don’t store it next to your stove top or right near your dishwasher). Make sure you use the frying basket and pan as directed so your foods don’t come into contact with the heating element. Also, avoid overfilling your air fryer. When you put too much food in, it doesn’t come out as good, has to cook for longer, and more grease and food particles can get onto the heating element.